Designers and manufacturers of commercial kennel and boarding facility layout and equipment, Infrared Concepts is your source for design specialists that can help you in the planning phase. Our consultants are eager to assist you in determining product selection, configuration and control options and are authorities on the proper use of infrared comfort heating technology. Heaters can be arranged in ‘zones’ resulting in complete control within the facility. Options could include automated energy management systems, timed functions, intensity adjustability, and even motion activated devices. 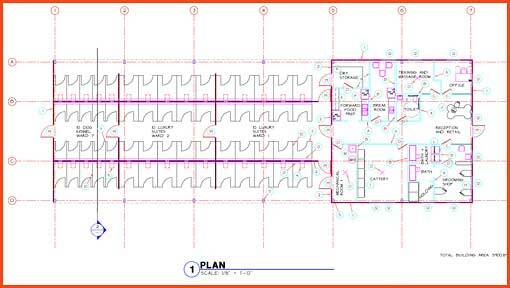 We can provide support with detailed wiring diagrams. Our heaters are Underwriters Laboratories (UL) and Canadian Underwriters Laboratories (cUL) Listed under File E 29825 and are NZ/Australia and CE Listed under Wakefield Laboratories File NSW 21732. Fixtures are also certified IP X4 rated. Heaters range from 19” 750w single element fixtures for individual houses, up to 62” 6000w dual element fixtures that can be mounted up to 14’ with large coverage areas, and are available in 120v, 208v, 240v and 480v models that can be connected to either single or 3 phase power supplies. 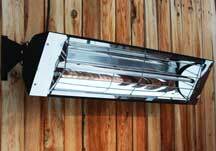 Heaters may be mounted to walls, ceilings, pole mounted or suspended. They require minimal clearances when compared to other products making them very visually appealing. Infrared heaters are weatherproof, eliminating many concerns about exposure to moisture and/or spray, and no ventilation is required. We would be happy to review your plans and assist you in creating an efficient system that will provide years of trouble-free service and create healthy and comfortable environments for your guests. Contact Infrared Concepts for complimentary consultations. Infrared Concepts is your Wholesale Supplier and Infrared Design Specialist.